Concern over rising inequality has certainly been a significant feature of recent intellectual and political discourse, particularly in the US (for example here). Let us suppose we were serious about reducing inequality, what would we do? One thing you would not do is significantly raise top income tax rates, that would not have much effect at all. Besides, at a certain point, one runs into significant Laffer Curve effects, which is why income tax rates have remained much lower across the Western world than they were in the immediate postwar decades--governments don't want to reduce their revenue by having tax rates too high. 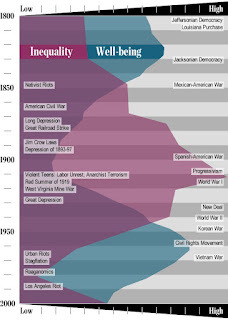 Since folk who worry about inequality tend to be nostalgic for the low-inequality postwar era up to around 1970, we an easily identify a range of policies which will reduce income inequality. 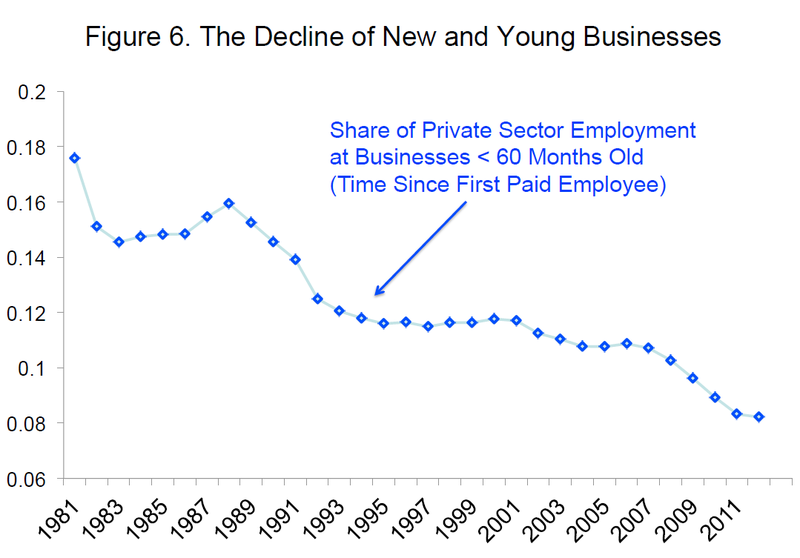 (1) Massively cut back on higher education. Since higher education generates low income students in their 20s who tend to become high income professionals in their 40s, the higher the use of higher education, the greater is life cycle inequality. Also, since higher education is more expensive than primary or secondary education, and with very few positive social spillover effects (though we can identify some negative spillover effects), government support for higher education tends to be subsidising those with higher future incomes. Moreover, the higher the level of education, the higher the gap between male and female earnings and, the higher level of education, the more differentiated by ethnicity incomes are. the period of the 1970s was a transition from marriage as production complementarity (I’ll bring home the bacon, you fry it) to consumption complementarity (let’s make sure that our leisure interests coincide). This form of marriage turns out to be much more class-selective. Putting women back in the home would reduce household income inequality significantly while the increased general labour scarcity premium would make it easier to support families on a single income. (3) Massively cut back on immigration except for those with high levels of compatible human and social capital. As Sweden is finding, immigration can be a great generator of income inequality. Importing low skill migrants reduces the return to labour, especially amongst low skill residents (pdf), and, as increasing the median return to labour is central to reducing income inequality, any immigration that decreases labour scarcity will tend to increase income inequality. (4) Abolish residential zoning. Housing capital is a major source of wealth, and residential zoning increases the scarcity of land available for housing, driving up housing costs. Low rents and cheap housing reduces income inequality. (5) Eliminate occupational licensing. 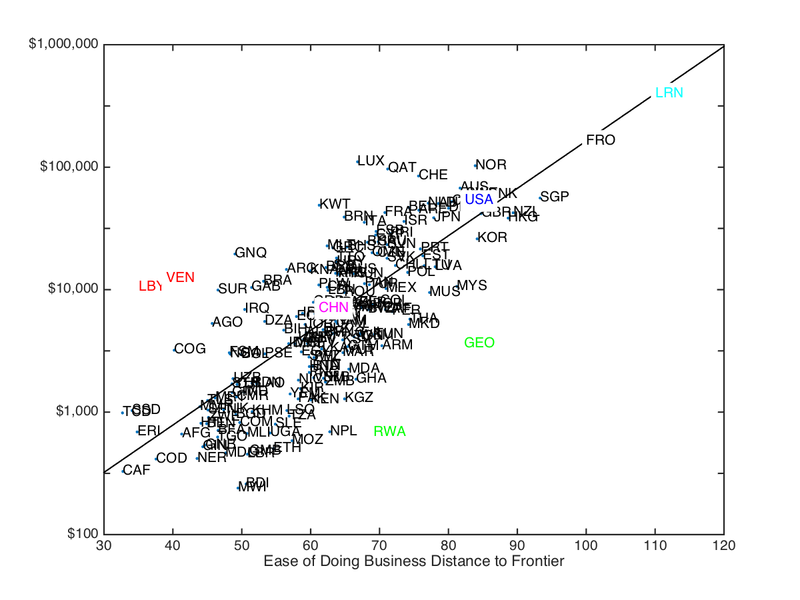 Occupational licensing increases labour scarcity in a very selective (and unequal) way. Indeed, a lot of regulatory approval systems have very unequal effects on income prospects. (6) More mass conscription wars. The broader the section of the population needed to fight, the higher the incentive to engage in broad social bargaining and the easier such bargaining becomes through a sense of urgent common purpose. Of course, there has to be that sense of urgent common purpose for the effect to operate, otherwise one just gets increased internal social division, which is not good for income inequality. 1. Have a lower proportion of low skilled immigrants and a higher percentage of high skilled immigrants---there are plenty in India and China who wish to come here, but also more than you might expect from Africa, the Middle East and Latin America. 2. Weaken intellectual property rights. I don't favor eliminating them, but I'd prefer to keep them only for entirely new inventions, not improvements of existing products. Copyrights need to be made much shorter. 3. Change zoning laws to encourage more building. This will be really hard to do; indeed I think things are likely to get worse, not better. 4. Replace income taxes with progressive consumption taxes and low wage subsidies. Eliminate cigarette taxes. Legalize drugs. All sensible and worthy proposals. In reality, those most inclined to complain about income inequality would be those who would be outraged by any attempt to implement any of the above policy agenda(s). Yet their preferred agenda of increased tax-and-spend would be very unlikely to have any equivalent effect. First, it requires even more urgent attention to economic efficiency to pay for the increased government activity (which is why the Scandinavian states tend to rate so high on economic freedom), which tends to be antipathetic to income-flattening agendas. While wholesale adoption of the full Scandinavian package in geographically and ethnically diverse societies such as the US or Australia has other problems and is not likely to have the intended effect. Second, a tax-and-spend agenda is precisely what has driven California into becoming ever more unequal in income, as the middle are driven out by high taxes and regulatory complexity and the welfare dependant are attracted by high spending. Russian-American population biologist Peter Turchin has developed a sophisticated analysis of swings in equality and inequality based on levels of cooperation and inter-elite competition which he has applied to US history in particular (see here for a Salon article on the same). The model very much has a "good swings and bad swings" approach, where increasing cooperation and falling inequality are good and the decreasing cooperation and rising inequality are bad. So, the shift towards less income equality and less cooperation Turchin identifies as happening from the 1970s on is bad. Which naturally leads to dismissing of the entire shift in Western policy since the 1970s as a mistake. If we take a more nuanced view of social phenomenon, we might wonder if broad movements in public policy might always be at least somewhat mixed in their characteristics. Particularly in democratic polities, where policies are subject to scrutiny and debate. The 1970s were not a good period for Western public policy. 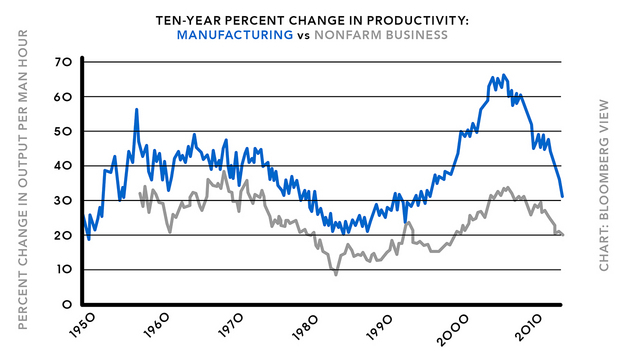 Productivity growth fell (for reasons which are still unclear) and stagflation blighted economies. The shift towards economic liberalisation occurred for good reasons and has a broad range of clear successes. The connection between economic freedom and prosperity is very clear, empirically. To characterise the shift in public policy as an attempt to wind back the welfare state is to characterise it as a clear failure--there was very little reduction in welfare spending or coverage. It is much more sensibly seen as policy coalitions attempting to create a sustainable welfare state (i.e. enough economic growth and efficiency to support welfare spending): at which it has been rather more successful. Particularly during the Great Moderation. of ease of doing business. It is also important not to exaggerate how much economic liberalisation there has been. Governments are much less likely to own firms and have become much less likely to regulate quantities (except in land and taxi markets) or regulate prices (except in labour markets). 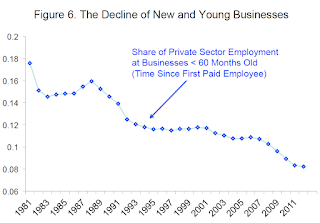 But the wider regulatory burden has continued to increase (pdf); a cost which falls disproportionately on new businesses, small and medium-size businesses and other economic entrants. Casualisation of employment is often seen as a negative development. But if more and more regulatory (and contract) complexity is loaded onto full-time employment, alternative means of employment become more attractive (for both employers and workers). Casualisation is often an indicator of the level of labour market regulation. Then one gets interaction effects. Increased regulatory complexity increases economic rents (income not based on productive activity). Yet casualisation makes it harder for workers to capture such economic rents, which may help shift incomes within firms from labour to capital. What has undoubtedly intensified are the culture wars. Which is the other problem with focusing on specifically income inequality; as the period since the 1970s has also seen very significant social liberalisation. Building on the 1960s ferment to be sure, but going considerably further. Whatever the virtues of that social liberalisation, it is likely harder to garner social cooperation when basic assumptions about the framework of cooperation fray--even more if they fray for very understandable reasons. It is also analytically dubious to concentrate quite so much on the US. EU politics, for example, are showing much more signs of voter distress, anger and alienation. And doing so in countries whose economies are (generally) rather more regulated than the US economy. 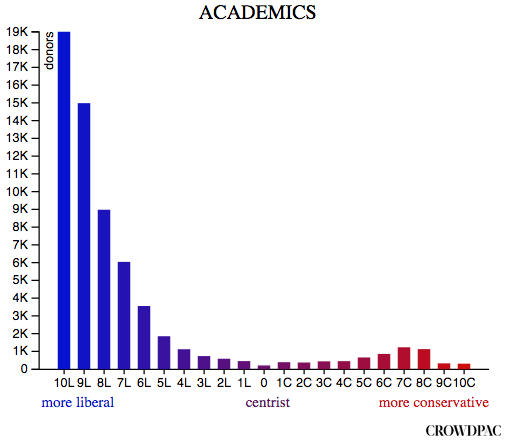 Academics, journalists and IT professionals have become very narrow in their ideological range which also shows up in their pattern of political donations. This gravely handicaps their ability to promote broad social bargaining and cooperation. In fact, it tends strongly to have the opposite effect--to preach and alienate; to comprehensively not understand the concerns of people with views they almost never socialise with or have to grapple with seriously. US political donations by industry. Moral psychologist Jonathan Haidt's attempt to foster intellectual diversity in the US academy is a much more hopeful attempt to increase social cooperation than buying into "the entire shift in global shift in policy since 1970s, it's all bad!". Particularly given that very same global shift has seen the most massive exit from mass poverty in human history. Broad trends in public policy, particularly in democratic polities, likely have strengths and weaknesses. Over time, the strengths can get exhausted and the weaknesses multiply. Which tends leads to a swing in a different direction, where the same thing happens. And so it goes. Conversely, an ideologically narrow academy is very naturally inclined to see public policy trends as "bad" or "good" and point to folk not in any of their rooms and say "it's all their fault". Nor is merely being cross-disciplinary going to fix the problem, if it is essentially the same ideological range repeating itself across disciplines. 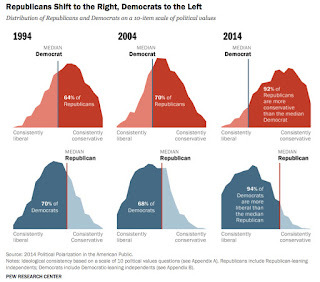 And yes, the US Republican Party is having a bit of a meltdown; but both US Parties have become more ideological. While conservatives in the US have been on the losing side of a series of cultural battles and, in public policy, what wins have conservative Republicans had since welfare reform after the 1994 midterm elections? If the answer is "not much", then their anger and alienation become much more understandable. Social cooperation means precisely that, cooperation. It does not mean "you are evil, malicious and wrongheaded unless you agree with us": demanding surrender is not cooperating. Buying into "those folk over there, they're all wrong" is not fostering cooperation. No matter how sophisticated your underlying analysis. ADDENDA The age-cohort demographics are also not helpful to reducing inequality. 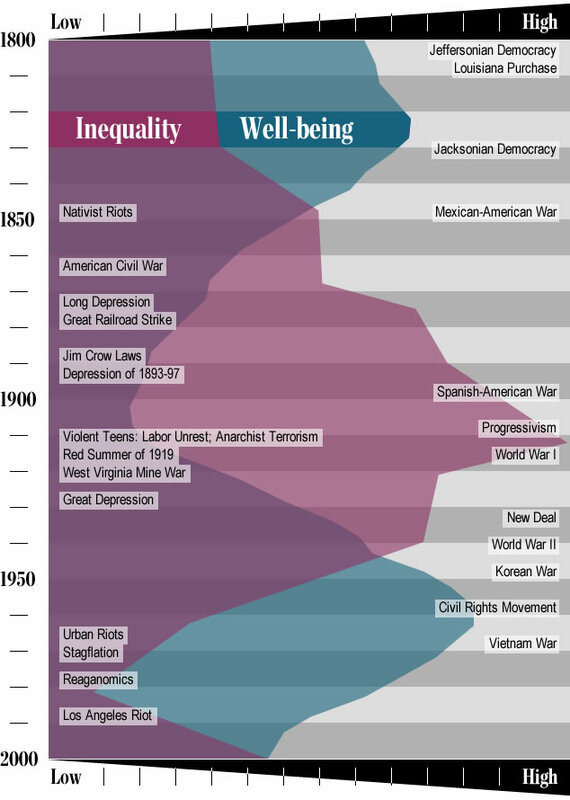 AND ALSO Paul Graham has a useful essay on economic inequality and another on why 1945-1973 was so different to what followed. Dean Baker examines economic rents as a factor in increased income inequality.